It’s quite hot here. It was hot in northern India too, but that was a dry, arid to desert heat, this is humid, sub-tropical heat.. It doesn’t help that I have a bad cold and I’ve been burning through toilet paper repurposed as tissues while chugging entire water bottles in an attempt to rehydrate. Also not helping is the fact that air conditioning is a rare commodity in India, not possessed by the vast majority of eating establishments, nor by my dirt cheap hostel. I’m actually writing the first half of this update from the wonderfully air conditioned lobby of the Taj Mahal Palace Hotel, a building ironically known for blowing up rather than keeping cool. I’m out of the dry plains and desserts of Uttar Pradesh, Delhi, and Rajastan in the north, and I’m slowly making my way into the jungle-filled south. Mumbai is latitudinally in the middle of India and hanging off the West Coast. Fortunately I can take respite from the sun under the thousands of huge, dark green trees throughout the city. Like Singapore and Kuala Lumpur, Mumbai feels like a city built in a jungle, and still retains sizable forests and canopies hanging over crowded streets. It’s a nice change of pace from the north aesthetically, even if I can do without the humidity. Mumbai is sort of the Hong Kong of India. It wasn’t a major city before the Europeans arrived but now it’s the economic capital of the country and by far the most developed city. 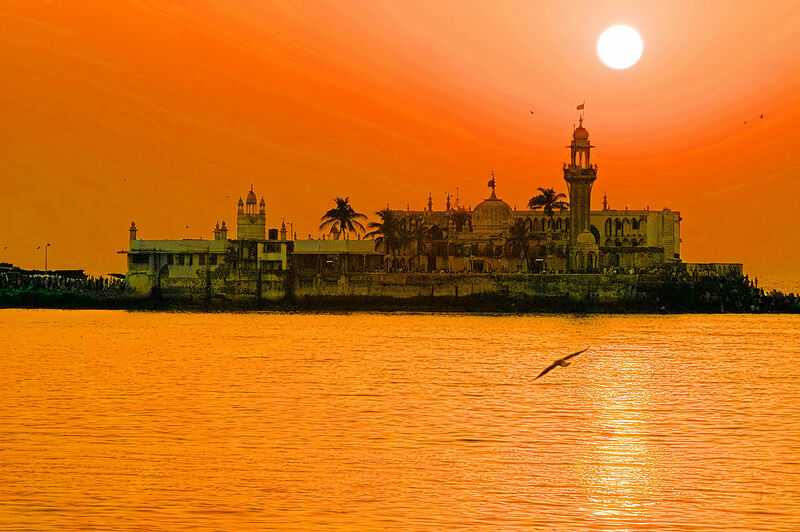 Mumbai was a tiny fishing village that was turned into an outpost by the Portugese in the 1534. 130 years later it was gifted to the British as part of a dowry to cement an alliance to the Portugese, and a few years after that it was turned over to the British East India Company, where it would become the seat of British power in Western India, matched only in authority by Calcutta in the East. The European legacy still really shows today. Unlike Calcutta, where it looks like all of the Europeans left their buildings and infrastructure to rot long ago, the center of Mumbai maintains its European vestiges in pristine form. European-style train stations, arches, university buildings, stock exchanges, churches, etc., all look like they could be featured in London today. All of these buildings are complimented by hands down the best streets in any Indian city, consisting of ample roundabouts, well maintained dark pavement, wide streets, and wide sidewalks. On the modern side, Mumbai is the only place in India which gets close to something like a skyline. It’s not complete, but along two particular bay coast lines, Mumbai puts up a decent row of buildings, including a couple of legitimate skyscrapers. Bikes are far more rare, and taxis out number took- tooks, especially in the more modern areas which seem tobe exclusively used by cars. The city center also has a much larger concentration of modern stores and shopping centers than I’ve seen in Delhi or Calcutta. Mumbai’s one infrastructural short coming is city-wide transport. The only metro line is in the far north of the city. Instead, the city’s 12 million inhabitants rely on the only eight-track train system to move throughout the X square mile city. Unfortunately, it takes me about an hour to get from my hostel in the north to the city center. The farther one walks away from the city center (which is really the tip of the city hanging out in the Indian Ocean), the more the European influence fades and the city feels more Indian. It gets dirtier, more chaotic, and smellier. The last part really needs to be emphasized: outside of the city center, Mumbai smells bad. A lot of parts smell like sewage, the rest just smells like garbage, much like Dhaka. Despite being the wealthiest city in India, Mumbai has lots and lots of poor people. The Dharavi district is the second largest slum in all of Asia (behind only Mexico City’s biggest slum). Even in the middling area where I was staying, there seemed to be more poor people than usual, even for an Indian city. This means more beggars on the streets, more people sleeping on filthy blankets on the sidewalks, and more hovels made of bits of cement and garbage in dirt clearings next to buildings. I remember hearing in a Vice documentary that Dharavi basically survives off of the garbage produced from more affluent neighborhoods, so I’m guessing the whole city attracts the poor of India hoping to live off whatever scraps they can scavenge from the rich. Mumbai’s wealth has a downside. In all of my time travelling, I have never seen a single city in a country that was so much more expensive than its surroundings, with the exception of Hong Kong in China. I haven’t paid more than $6 per night at a hotel or hostel thus far on the trip, and I’ve managed to pay as little as $3 per night in Jaipur. In Mumbai, I could not find any hostels, and I could not find any hotels anywehre near the city center for less than $20 per night. After hours of searching, I finally stumbled upon a guest house way up in the north for $5 per night, but it is barren to say the least. There is only one other white guy there besides me. On the other hand, prices in the rest of Mumbai don’t seem too bad. My 40 minute train ride in the morning only costs 10 rupees, and that’s for first class. Wikipedia says Mumbai has real estate prices as high as Manhattan, so maybe it’s predominately real estate inflation. On Day 1 I took a brief trip down town to figure out how the train system works and walk around the hear to Mumbai a bit. Noting that transportation took about an hour, I woke up at 7 AM, to get an early start on the day. I promptly fell asleep again at 7:01 AM and didn’t wake up until nearly 8 AM. I managed to get on the metro which connected me to the main train by 8:45 and I didn’t arrive downtown until 10 AM. This was a big walking day. I took frequent breaks because my nose was constantly running and I felt very weak, though my condition improved later in the day. I walked a stretch of southern Mumbai from Victoria Terminus to Colaba, a peninsula sticking out into the Indian Ocean. This area was the cneter of British rule and contains most of the remnants of the Empire, including Victoria Terminus, Mumbai High Court, all of the buildings in Mumbai University, the Prince of Wales Museum, and the Gateway of India. All of these buildings are gothic and English style and tower over their surroundings. In between the famous buildings are plenty of minor, unnamed ones, which actually look a lot like the structures at the center of UChicago’s campus. As mentioned, they are extremely well maintained, and all seem to still be in use today. I stopped at the Prince of Wales Museum, which you can also call the Chhatrapati Shivaji Maharaj Vastu Sangrahalaya Museum, if you really want to. Surprisingly,the museum is neither about the Prince of Wales nor whatever that Indian thing is, rather it contains an odd scattershot of exhibitions including presentations of early Indian civilization, Mesopotamian art, modern art, local and exotic wild life, and Chinese and Japanese crafts. I have no idea what they were going for, but it was a pretty good museum. It was one of the few museums on this trip with well written descriptions that I actually wanted to read. Though I am annoyed that I couldn’t bring my camera in without paying an extra $3 (I left my camera with the baggage handler). Also there was only one bathroom, and it was on the bottom floor, so without my bag and the toilet paper I use as tissues in it, I had to keep running up and down flights of stairs to get more toilet paper from the bathroom. This was not fun. The Gateway of India (which isn’t the same thing as the India Gate, which resides in Delhi) is another Arc de Triumph knock off, though it’s a bit shorter and wider. It’s in a really nice clearing on the water, across the street from the Taj Mahal Palace Hotel. Weirdly, the gate was built to commemorate the visit of Queen Victoria and her husband in 1911. It seems a bit much to me. As mentioned, I started writing this update during an hour long walking break in the Taj Mahal Palace Hotel. On November 26, 2008, Mumbai was hit with a series of terrorist bombing orchestrated by Lashkar-e-Taiba, a radical Islamic group seeking to force India to release Kashmir to Pakistan. One of the bombs blew up the hotel’s roof, and the terrorists barricaded themselves in the hotel along with hundreds of hostages, including 450 guests and the present staff. 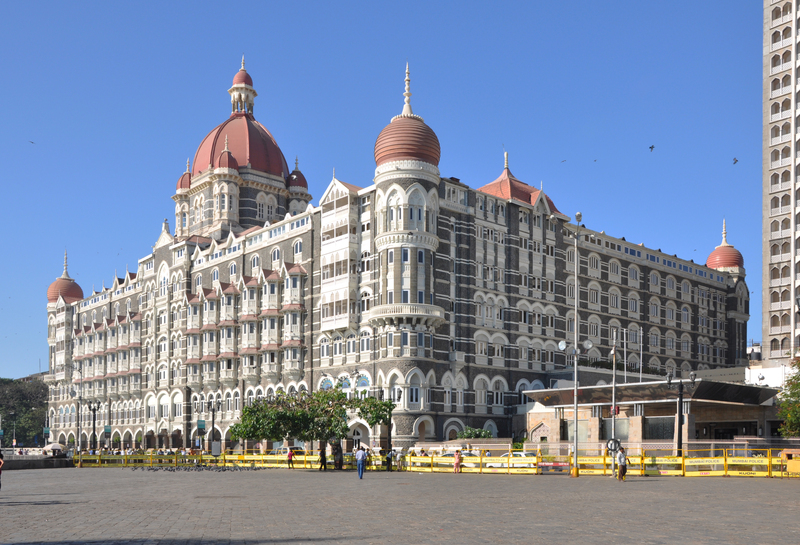 Eventually Indian commandos stormed the building and rescued most of the hostages, but 31 individuals died, including 12 hotel staffers and 19 guests. There are some low profile reminders of the bombing at the hotel today. There is a memorial in a small and (I’m pretty sure) inaccessible courtyard, consisting of one of those waterfalls over brown rock things that super fancy hotels and malls some times have. It’s about two stories tall and there is a marble wall next to the waterfall with all of the victims’ names on it. It’s not too much of a memorial, but considering that this is a super fancy hotel, I suppose they don’t want to bum their guests out, if not scare them, by reminding them of the horrible thing that happened at the hotel not long ago. I like to explore super fancy hotels so I walked around the lobby and shopping area on the ground floor a bit. There was a really nice pool which I’m fairly confident I could have snuck into, but I didn’t have a bathing suit with me. One area has pictures of all of the famous people who have visited the hotel, including both Clintons, David Cameron, Barack Obama, and of course John Lennon and Yoko Ono. I checked out the dinner menu for one of the restaurants and saw the entrees were only about $30 a piece. Meh, I’ve seen worse. However, the wine paired entrees were around $100 a piece. That’s more like it. But it still doesn’t beat the $300 entrees at Abu Dhabi’s X hotel. I walked further south for about two hours until I neared the tip of the peninsula. I hit a few churches, having not seen any since Calcutta. One church had some carvings donated by the East India Company which was pretty cool. I really wanted to go to a church on my map called the “Afghan Church” but I couldn’t find it. I walked for another two hours north along one of the two main coastlines in Mumbai. There is a street which runs the length of this stretch of coast, a wide sidewalk along side it, a cement barrier which people sit on, and then the beach. The beach is filled with thousands of what I can only describe as massive, stone jacks from that game where you bounce a ball and pick up a piece before the ball lands on the ground. I cannot imagine how much these things way, but they stretch on for miles. Presumably they are there to prevent erosion so India’s premiere skyline doesn’t fall into the sea. I got a lot of attention on this walking stretch. Twice I was asked to take pictures of other people with my own camera. I don’t know why or what they get out of it. I guess the first group were too little kids and just thought my camera was cool, but they other group was a bunch of teenagers who have surely seen a camera before. I also climbed over some of the jacks, walked on the sandy parts of the beach, and touched the Indian Ocean for the second time (the first was in the UAE). I got some great pictures of the setting sun on the water and considered waiting for sunset, but it was only about 6 PM and thought it would take too long, so I set off for the nearest railway station. Wikitravel warns to never use the Mumbai trains during rush hour, especially not in coach. So I used the Mumbai trains in rush hour, in coach. Numerous times in these updates I’ve described metros and lines getting absolutely packed with people. Forget all of that–it was nothing. Or at least it wasn’t coach in the Mumbai trains during rush hour. The first two stops were fine, I even had ample room to sit on the ground. Then the surge came. These trains don’t have doors, so at every stop a bunch of maniacs always run alongside the train while it’s still moving and jump on, while equally insane people already on the train jump off. I even saw a guy jump off the train in the morning and smash into some poor bystander. When the train finally did stop, I was quickly pulled to my feet by my neighbor and we proceeded to pack that train to its limit. As in, seven or eight people were hanging off the train, holding on by a single leg and arm on both sides out of both empty door. I was pressed so hard on every side that I could not bring my arms up to take out my headphone. I could shift my arms to get to my pockets. I lost track of my bag in between other people as I held on to it with one hand for dear life. At one point, the hangers on closest to me launched a daring gambit to get themselves in the train (I think it was to avoid getting hit by an oncoming train). The pressure against me was so intense, that I genuinely feared my arm would break for a second as it twisted against me. I also couldn’t breathe for about ten seconds. The locals thought this was hilarious. *Irfan: On April 14, 2015, the Lahore High Court (Pakistan) released Zakiur Rahman Lakhvi, the alleged mastermind of the Mumbai attack. This entry was tagged India, Matt Faherty, travel blogging. Bookmark the permalink.